Shane serves as the Director of Evangelism for the Southern Baptists of Texas Convention. 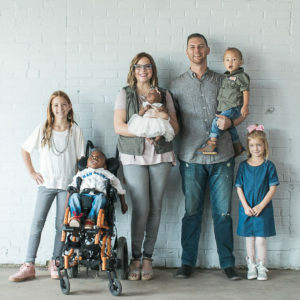 He and his wife, Kasi, reside in Rockwall, TX with their five children – Raygen, Harper, Titus, Elliot, & Glory. He has been in ministry for over 17 years as a church planter, lead pastor, associate pastor, and student pastor. He holds a Bachelor’s Degree in Biblical Studies, a Master’s Degree in History, and a PhD in Clinical Christian Counseling. Shane is also a traveling communicator, evangelist, and Bible teacher. Every year he speaks to tens of thousands about the good news of Jesus Christ. Shane is also the author of a popular blog, which has over 2.5 million views. His articles have been picked up by RELEVANT, Christianity Today, The Christian Post, The Gospel Coalition, CrossWalk, Church Leaders, The Baptist Press, FaithIt, HelloChristian, and many others. He and his wife, Kasi, were featured as ABC’s Nightly News “Persons of the Week” in August 2017. Shane has recently written a book with the major publishers, Waterbrook Multnomah and Penguin Random House. 9 Common Lies Christians Believe: And Why God’s Truth Is Infinitely Better is set to be released on February 19, 2019. However, is already available for pre-order on Amazon, Barnes & Noble, ChristianBook.com, Books-A-Million, or Google Play.